Expert knowledge and experience to bring you the world’s best equipment. At Coolvac, not only do we provide our customers with the latest technology, we also offer product and technical support and hassle-free online shopping. Coolvac are proud to be supplying premium products in New Zealand from Javac, Imperial, Telstar, Oerlikon Leybold, and other related brands. We have an extensive range of top quality products and industrial vacuum pumps to suit your needs, whether you’re a professional or a beginner. Coolvac New Zealand offers a range of dry vacuum pumps, oil free vacuum pumps, low maintenance vacuum pumps and screw vacuum pumps. Our expert team of highly trained technicians answer your questions and offer handy tips in our comprehensive Knowledge Bank. We can offer knowledge and service on dry industrial vacuum pumps, oil free vacuum pumps, low maintenance vacuum pumps and screw vacuum pumps. Are you installing or servicing large volume equipment including large A/C chillers, supermarket systems and the like. You need a Javac Two Stage Vacuum Pump with more than twice the capacity of the standard versions. 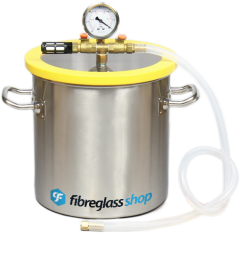 Typical chambers used in degassing many types of products like fibreglass, silicon, expoxy resins etc. No we do not sell the chambers but we do have the vacuum pump recommended by the Fibreglass Shop.